For our Interactive Qualifying Project, we worked in collaboration with the Boys & Girls Club of Worcester to build a science, technology, engineering, and math (STEM) program for their students aged 10 to 13. STEM is extremely important in today’s technology-driven society, and introducing kids to these topics early can open doors to a successful life. Ultimately, the Boys & Girls Club of Worcester (BGCW) will utilize this program to consistently conciliate interest in STEM. 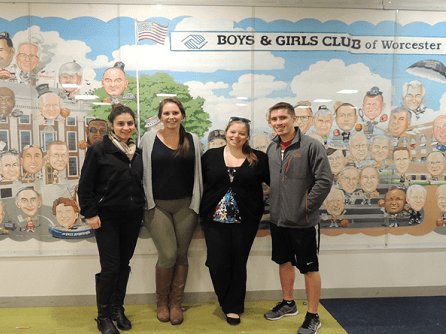 The Boys & Girls Club of Worcester is a non-profit organization that provides services for the neighborhood youth within the Worcester community. The organization helps its members develop qualities that will lead them to becoming active and contributing members within their community. The BGCW focuses on the importance of improving children’s lives and promoting strong relationships with the caring program staff. For more information about our sponsor, their website can be found here. We are (from left to right) Lubna Hassan, Lindsay Braith, Alexandra Bittle, and Michael Sullivan.